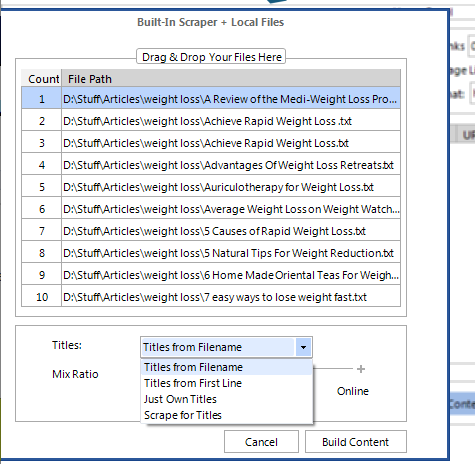 Since KontentMachine 2.13.9.34 you could build your campaigns by combining the built-in scraper and locally saved or PLR articles. In this tutorial, you will learn how you can do that. 4. Fill in the other boxes just like you are building a standard campaign – keywords, images, videos, spinner and select paragraph or sentence spinning. 5. Press Next and set up your anchor text. 6. When you start building your campaign, a new window will slide in. 7. Now just drag and drop all the articles you would like to use in this window. 8. Choose the mix ratio “local files vs. scraped” for the campaign. – You can take them from the names of the files. – Titles From First Line – if the first line contains the title. – Just Own Titles. If you select that option, an Own button will appear. Press it and type/paste your titles there. – Scrape for Titles. Kontent Machine will find titles for your campaign. KontentMachine will combine content from both sources according to your preference. It will also automatically select the tags, categories, summaries and resource boxes.